The tiger’s characteristic black stripes are not only stylish, they act as camouflage in the big cat’s natural habitat. 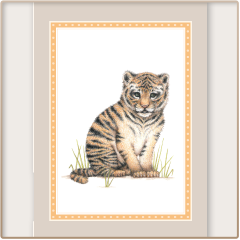 But you'll surely stand out in the mail with a pack of stylish tiger notecards. Notecards come in a clear-lid stationery box that is wrapped in tissue and tied with a bow!